Ijevan branch which is the only branch of Yerevan State University has a great role in solving the educational and cultural issues in the North-eastern region of the Republic of Armenia.With the curriculum of YSU, mostly through the efforts of professorial staff invited on business from YSU, and with the Bologna Process, the branch implements its educational mission with a high level of responsibilityand perfect level – issues that are so important and necessary for the region’s population. YSU Ijevan Branch was founded in 1994 on the basis of Ijevan Regional College. Taking into consideration the prospects of higher education development and the staff requirements of the North-eastern regions of Armenia, as well as taking into consideration the request of the Ijevan Regional Council of People’s Deputies (president J.G. 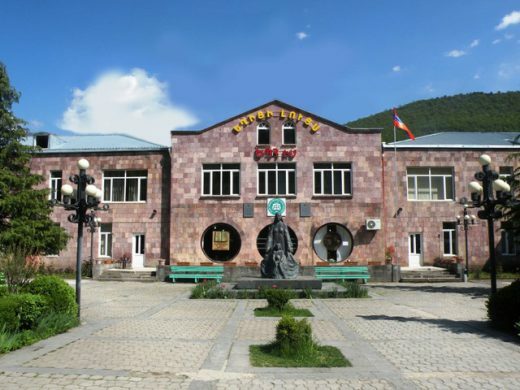 Ananyan), the Board of the RA State Committee for Higher Education and Science decided to set up a regional multi-branchcollege in Ijevan on October 10, 1991. Hamlet S. Karayan, Doctor of Physics and Mathematics, Professor, was appointed as the director.The status and structure of the collegewere clarified. According to the institution charter, which was approved by the OGP Committee of RA on November 11, 1991, it was established that Ijevan Regional College was ‘a higher educational and scientific state institution that is a primary institution in the North-eastern region of the Republic of Armenia and implements alternative education principals in accordance with the second level of a quadruple education system’. The newly-established institution included mainly state-funded departments, but in accordance with the spirit of the time it was also encouraged to implement additionalactivities of self-financingin the areas of education and science. According to the temporary charter, the college was called to raise the scientific, cultural, political and economic levels in the North-eastern regions of Armenia, to create a stable, high-quality scientific and cultural atmosphere there, a local intellectual school, to stop youthoutflow from the bordering areas, to prepare well-educated specialists with versatile abilities dedicated to national and universal culture,to promote the continuation of education for the most prominent students during the next steps of the higher education system. On December 9, 1991, the first orders referring to educational process were released. On the same day with the welcoming speech of Director H. Karayan the solemn opening ceremony of the educational institution took place. For organizing the educational process the professorial staff of Ijevan Regional College was invited from the capital. Among them were Grigor Avagyan- Correspondent Member of the RA National Academy of Sciences, Doctors of Sciences, Professors Valeri Ter-Antonyan, Roland Avagyan, Martin Abrahamyan, Ishkhan Khachatryan, Vidok Musoyan, Yuri Movsisyan, Artashes Papoyan, Rafik Harutyunyan, Mikayel Hovsepyan, Vladimir Abrahamyan, as well as dozens of Science Candidates. According to the decision of the Academic Council professional chairs (departments) were formed in the faculties.The number and names of the chairs have changed over time because of the start or stopping of new specialties. In accordance with the College Charter, there was a two-level learning system.In other words, students who received ‘good’ and ‘excellent’ marks could continue their professional education at the university from the third year of their education and get a Bachelor’s Degree.Low-achieving students received a three-year final specialized education and graduated with a diploma of a junior qualification. By the decision of the Government of the Republic of Armenia #440 of September 19,1994‘Ijevan Regional College’ was reorganized as ‘Ijevan Branch of Yerevan State University’. New structural changes were made in the institution, the first graduates with three-year education graduated from the institution. In the summer of 1995 the branch provided its first graduates with Bachelor’s degree in education – 59 professionals. From April 1996to October 2000 Ijevan Branch of Yerevan State University was headed by Doctor of Economics, Professor Shavarsh Margaryan. In order to improve the quality of the future specialists and to make the work of faculties and chairs effective by the decision of the Scientific Council of May 18, 1996, several chambers were dissolved and renamed:13 chairs were organized in the branch. Sargsyan Spartak – Dean of the Faculty of Applied Arts, Member of the Artists’ Union of the Republic Armenia. Physical Culture and Civil Defense. Since 2000 till now the director of YSU Ijevan Branch has beenSamvel Arshaviri Arakelyan – Candidate of Historical Sciences. In recent years YSU Ijevan Branch has been marked with a period of educational reforms.Continuous work is carried out to stabilize and develop the academic process. Academic curriculum and plans are being improvedas an important precondition and warranty for updated learning. The main task of the branch is to ensure the content of university education and the high quality of education. The list of professions has been revised according to economic relations.Graduates of the faculties of Natural and Humanitarian Sciences and of Applied Arts, getting qualifications of pedagogues, provide the requirements of teacher- specialists in the system of general education in the region. The best graduates of the faculty of Applied Arts successfully carry out the great mission of preserving, developing and transferring national-cultural traditions and values to future generations. Currently, more than 1700 students are trained on 10 specialties in the 4 faculties of the branch, of which over 400 study free of tuition fee. It is the fourth year that the branch opened its Pre-university Education and Distance Learning Departmentwhich was dictated by the demand of time.More than 600 students are enrolled in the Distance Learning Department. Based on the regulations in YSU, updated educational guidelines, internal disciplinary rules have been developed by the branch and approved bythe Scientific Council. The Faculty of Natural Sciences has 2 departments(Programming and Information Technology, General Mathematics and Natural Sciences) and carries out 2 educational programs (‘Informatics and Applied Mathematics’ ‘Cartography and Cadastral Affairs’). Laboratories of General Physics and of Professional Computerfunction at the Faculty. The Faculty of Humanities has 5 departments (Armenian History and Social Science, Armenian Language and Literature, Pedagogy and Psychology, English Language and Literature, French Language and Literature), 1 section (Russian Language and Literature) and carries out 7 educational programs (‘History’, ‘Armenian Language and Literature’, ‘Psychology’, ‘Pedagogy and Psychology’, ‘English Language and Literature’, ‘French Language and Literature’, ‘Elementary Pedagogy and Methodology’). The Faculty of Economics has 2 departments (General Economics, Tourism Management and Culturology) and carries out 2 educational programs (‘Theory of Economics’, ‘Service’). The Faculty of Applied Arts has 2 departments (Decorative and Applied Arts and Design, Drawing, Painting and Sculpture) and carries out 3 educational programs (‘Applied Arts’, ’Design’, ‘Computer Graphic Design’). There are 4 studios and workshopsfor painters and graphic designers, 2 for textile processing, 1 for design, 1 for clothing modeling, 1 for ceramics, 1 for sculpture and 1 for wood art. Since 2006, the department has a ‘Distance Learning Department’, where a five- year program of Bachelor’s Degree in 13 specializations is carriedout (‘Armenian Language and Literature’, ‘History’, ‘Psychology’, ‘Pedagogy and Psychology’, ‘Elementary Managerial and Methodology’, ‘ Applied Mathematics and Physics’, ‘Ecology and Nature Management’, ‘Ecological Chemistry’,’Cartography and Cadastral Affairs’). At present, more than 500 students study 12 specialties in 4 faculties of full-time learning system and more than 1000 students study 13 specialties in the distance learning system. To make the students’ day at YSU Ijevan Branch interesting and entertaining (in academic, scientific, educational, cultural spheres, in entertaining events and initiatives), to promote the legal consciousness and patriotic spirit of the students – these are the responsibilities of the Students’ Self-governing Bodies: Student Council (SC), Students’ Scientific Society (SSS), the Military-Patriotic Club ‘Tavush’. The branch has 3 computer labs equipped with modern computers, a library (with 12500 units and 1500 e-books), which also includes 2 comfortable reading rooms equipped with modern technical equipment. Since 2009, the Alumni and Career Center has been operating in the branch, whose main goal is to contribute to the growth of competitiveness of branch students and alumni in the labor market, as well as strengthening the constant link between the graduates and the branch.